Sign up for a chance to participate in the Xbox One and Nintendo Switch Early Access. There is a limited number of spots available, so sign up now! Will I keep all my progress and unlocks after launch on November 6th? Yes! Everything you unlock and every level you gain will stay on your account. How will I know if I got accepted into Early Access? Once you sign up, you will receive a confirmation email. If selected, you will receive a follow-up email when Early Access begins. When does Early Access start? Very soon! Keep an eye out before November 6th! Can I sign up for both Xbox One and Nintendo Switch Early Access? Will I need a Ubisoft account to sign up for Brawlhalla Early Access? You will need one to sign up for Early Access and receive your email confirmations and codes. Brawlhalla does not require a Ubisoft account to play. I play on Xbox One and my friend plays on Nintendo Switch. Can we play online together? Currently crossplay is not supported. Will I need Xbox Live Gold to play Brawlhalla on Xbox One? All Xbox One accounts can play offline game modes. Xbox Live Gold is required for online play. 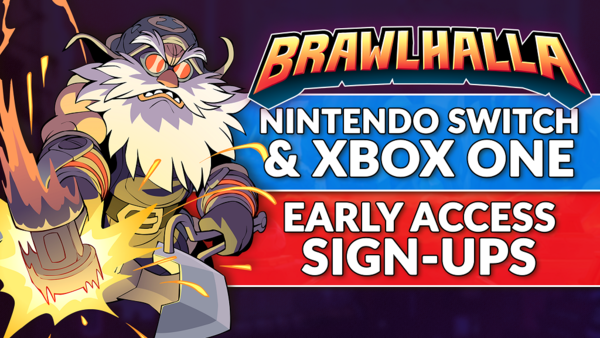 Can I play Brawlhalla without a Nintendo Switch Online membership? Yes! A subscription to Nintendo Switch Online is not required to download or play Brawlhalla. What happens if there’s a bug or a crash?